Heat oven to 375°F. Lightly grease 8-inch square (2-quart) glass baking dish with shortening or cooking spray. Place blackberries in dish; drizzle with lemon juice. In medium bowl, stir egg, sugar and flour until mixture looks like coarse meal. Sprinkle over fruit. Drizzle melted butter over topping. Bake 40 to 45 minutes or until topping is lightly browned and filling is bubbly. Cool 10 minutes. Serve warm with ice cream. 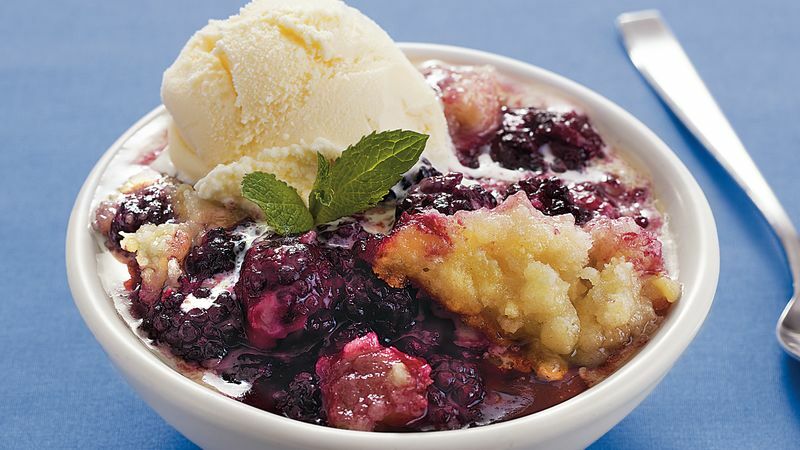 For individual cobblers, grease 6 (8-oz) individual baking dishes (ramekins); divide blackberries and topping evenly among dishes. Place on foil-lined cookie sheet and bake as directed.